Background: Endometriosis remains a challenging condition for clinicians to treat. To improve our results, we have to develop new treatment strategies based on pathophysiological mechanisms targeting the etiologic and pathogenic processes involved. Objectives: Revise new inflammatory pathogenic mechanisms involved in endometriosis, namely inflammasome. Method: Literature review for the updating of data to give new clues for different options of treatments. Results: Inflammasome has been described as a multiprotein complex and is considered a key regulator of the innate and adaptive host response that surveys the cytosol and other compartments into the cell. It is involved in the immediate detection and responds to the presence of danger- and pathogen-associated molecular patterns named DAMPs and PAMPs respectively, and has been described in several cells, mainly on immune cells of the myeloid lineage and epithelial cells in tissues with mucosal surfaces. Four inflammasome are formed in a stimulus-dependent manner of distinct composition. They are the Noll Like Receptors (NLR) proteins Nlrp1b, Nlrp3, Nlrc4, and Nlrp6, as well as the absent in melanoma 2 (AIM2). They activate the production of IL-1β and IL-18 that induce a host response such as pyroptosis, a proinflammatory cell death and the secretion of leaderless cytokines and growth factors. Inflammasome is linked to atherosclerosis, periodic fever syndromes, vitiligo, Crohn’s disease, gout, asbestosis, silicosis, Alzheimer’s disease and periodontitis. Endometriosis has been related with IL-1β and Another NLR, Nlrp7, was correlated with myometrial invasion in human endometrial cancer tissue. 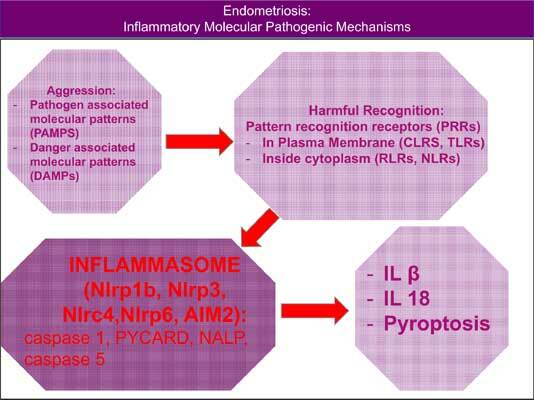 Conclusions: These new clues regarding the pathogenic mechanisms involving the inflammasome may be crucial in the future development for endometriosis therapy. Keywords: Molecular, pathways, inflammation, NLRP-3, DAMP, PAMP. Keywords:Molecular, pathways, inflammation, NLRP-3, DAMP, PAMP. Abstract:Background: Endometriosis remains a challenging condition for clinicians to treat. To improve our results, we have to develop new treatment strategies based on pathophysiological mechanisms targeting the etiologic and pathogenic processes involved.